Crank is partly the reason this blog exists. I first heard it last year after Ogmonster and Kismeth posted it on www.stonerrock.com. I was so impressed ('Don't Push Me Away' is a stand-out) I was inspired to make my own compilations, evolving into this blog. It rekindled a woefully neglected interest in obscure rock that I developed some years earlier, after finding uploads by 'ChrisGoesRock'. He ripped a huge rare rock vinyl collection and shared it with the world in the early 2000's when torrent sites were just emerging, introducing me to amazing albums by bands like Sir Lord Baltimore, Bang, Captain Beyond and Leaf Hound. I made a bunch of tape compilations for myself and friends, the rest is history as they say. 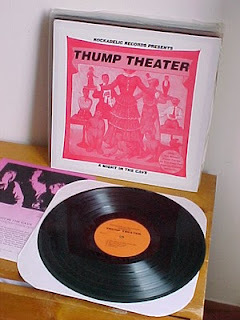 It's the b-side of a split LP, featuring the bands 'Thump Theater' and 'Crank'. It's not clear when it was recorded (69-71 approx) or what became of the bands. "Heavy-rock with progressive touch, split lp unearthed by the rockadelic label featuring ultra-rare underground 70s hard rock sounds (c. 1971) with one side by each band. these tapes came from the cavern sound studios (stoned circus, bulbous creation, phantasia, trizo 50); the crank tape had ‘zep jr.’ written on the box, which is pretty accurate frame of reference. Thump Theater offers a more progressive rock sound with some good guitar breaks and catchy lyrics. last copies from a long gone edition from 1997 of around 600 copies." As for Crank's music, it's consistently heavy, tightly played energetic hard blusey rock, packed with sharp riffs. Owing a debt to Led Zep no doubt, but with it's own brand of aggression it stands on it's own merit as the sound of a young and extremely talented band that could have gone on greater success. The final track regresses slightly in to standard blues-rock, but this is eminently forgivable, acknowledging the influences this music emerged from. This really deserves to be on here, so ENJOY! 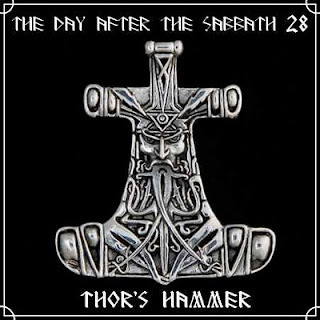 Volume 28 of TDATS: Thor's Hammer, features bands from Scandinavia and related Nordic countries (Edit: Since doing this I have also made 72: Denmark | 81: Norway | 75: Sweden | 88: Finland | 124: Iceland). As we know, they have an awesome track record in heavy music, their dedication, seemingly instinctive musical talent and made-for-metal cultural heritage will continue to amaze. Trúbrot kick off the proceedings, one of Iceland's foremost rock bands from the late 60s, they played many styles and had some decent heaviness here and there. Blues Addicts introduce themselves with some nice honest heavy blues, lead vocalist and guitarist Ivan Horn later joined C.V. Jørgensen amongst many other "big" Danish bands. Apollo, who were mostly made up from members of the popular Finnish band Topmost, play some loose psych with doom feel. Høst have featured on previous comps, a very talented Norwegian band who's heavy prog often veered into NWOBHM-like territory, well before it's inception. I really like the Trettioåriga Kriget track here, it's an involved piece with some jarring time-changes that I can imagine experimental metal bands like Meshuggah having fun covering. Rhapsody are a good example of where metal was heading towards the late 70s with the rise of bands like Judas Priest. Sume offer a chilled track for a pleasant half-time breather before the compilation ploughs to the end with some nice Sabbathy doom from Moses and more awesome prog showmanship from Råg i Ryggen.